Browsing "DS Black Cat Creations (CA)"
I’ve been sewing the Ramblin’ Rose quilt pattern this week. Of course, some of the week was spent staring in awe at the blizzard and then staring in awe and dismay at the snow drifts. Then came the shoveling… the porch, the walk, and a path in the yard for the dogs. And we had lots of brief power outages. Just for a minute or two, but enough that you didn’t dare leave a computer on or a computerized sewing machine! So sewing went a little slow. I’m sure many of you experienced an unusual week with this storm that effected so much our the U.S. Hopefully all is well and you’ve dug out and are ready to move on! Back to the pattern… The directions for Ramblin’ Rose are so easy to follow. Claudia tells me all her patterns are like this and are the result of their pattern format and reviews with the Black Cat Creation crew. The cutting directions include layout diagrams for all the pieces that are required. 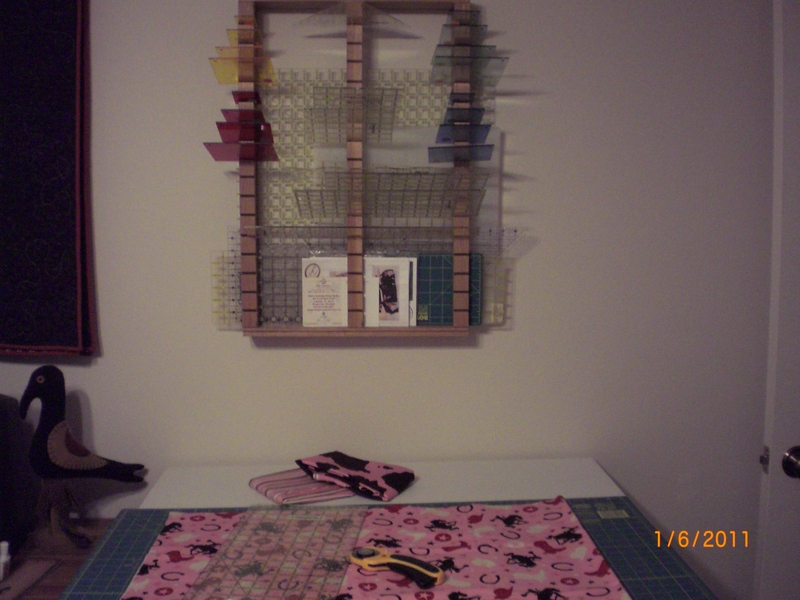 This is a big help… I’m never sure which piece to cut first and how to lay it out so that I have enough material to cut the remaining pieces. The diagrams eliminate that problem. The sewing directions again included a diagram. After constructing the background it was easy enough to layout the applique pieces using the pattern cover as a guide. The directions say that you can place the applique so it’s pleasing to you, but I needed help and the picture was just right. A few things I did different… the fabric requirements call for Jumbo ric rac, so that’s what I bought. I think Jumbo in one store is just Jumbo, and in others it is super giant oversized Jumbo. That’s what I bought – the ric rac on steroids. But I like it. When it came to the flowers I imagined purple but when I laid it all out the pink looked better. 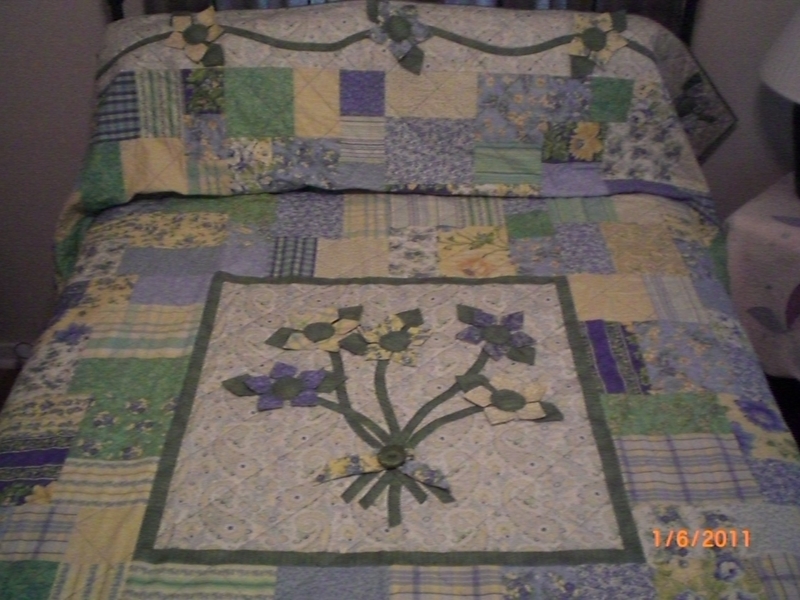 It went well with the green and it lent a softness to the whole quilt. My pink fabric showed some of the background through it so I cut extra flowers and used two pieces for each flower – one just a little smaller than the other. This blocked the background and as an added bonus, added more dimension to the project. The applique still needs to be sewn down, the top needs to be sandwiched and quilted, then bound. But, hey, we’re on the way! Now, don’t forget to leave a comment for a chance to win “A Bouquet For My Love“…. it’s a gorgeous quilt! Have you made any of these patterns? 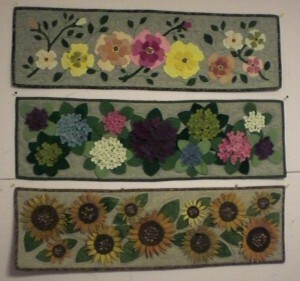 Sunflower Farm has the look of a sampler quilt, but is really only four simple blocks. The wool applique is free edged and held down with a few easy embroidery stitches. Finishing at 75″ x 87″, whether you lay this quilt on a bed or hang it on a wall, it will brighten up the space. The Trail Mix quilt pattern is made of a combination of oversized blocks and smaller accent blocks. This pattern is perfect for the beginner; it will yield quick, striking results. At 72″ x 72″, it’s bigger than you’d think. Use this pattern for teaching a friend to quilt. If you are an old pro, you can whip up a couple of coordinating quilts for tossing on the couch and a chair in the family room. On The Edge has an easy center so you can concentrate on the borders. Use a panel fabric or a favorite fabric that you just haven’t been able to cut into. Then select your border. At 36″ x 45″ these make great baby shower gifts. My Favorite Bag is a versatile pattern. There are three strap options – choose the one that works for you. With lots of pockets all your ‘stuff’ will have a place. The outside back has a 6″ x 8″ pocket. The inside of the bag has double pockets on each side of the lining. These pocket can be divided to suit your needs and what you carry. Will you be adding any of these to your ‘must-do’ list? It’s always interesting to talk to people that share the same interests; to hear about their take on things and how they got started in this wonderful world of fabric. 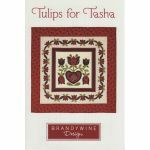 In the past few days I’ve been learning all about quilt designer Claudia Atchison, pestering her with questions and requests for pictures. Here is some of what she had to say . . . .
My great-grandmother was a quilter and did all kinds of hand work. She taught me mostly embroidery and crochet. She will always be my greatest influence. She had stopped quilting by the time I was old enough to learn from her, so quilting came later. I continued to sew and by the time I was twelve I was sewing my own clothes and by high school I was getting paid to sew for friends. 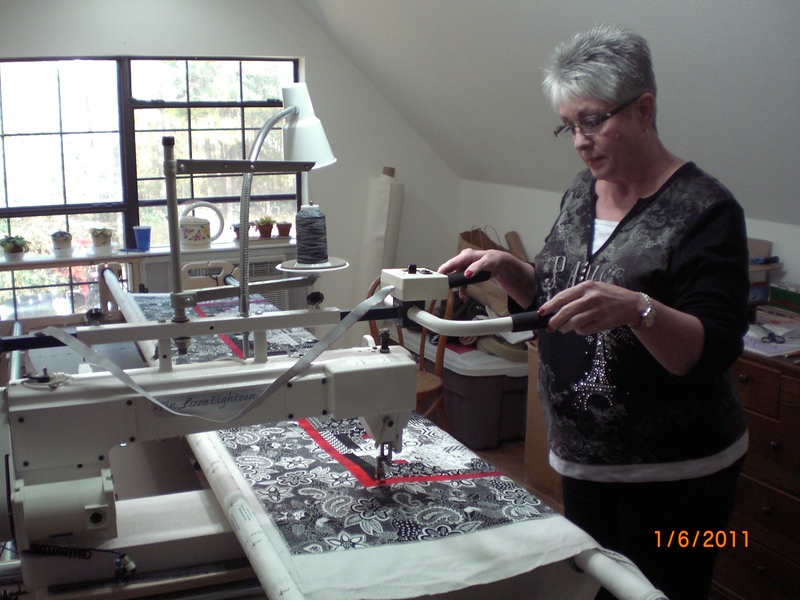 In the mid 1980′s I took a quilting class at the community center in North Richland Hills, TX. When the class ended I was hooked. There weren’t any quilt shops in my area, but I bought a few books about the basics and learned more as I made a few quilts. In the mid 1990′s I worked for an applique designer, Robyn Pandolph, and helped make samples. This is when I fell in love with applique and all things folk art. A love that, like quilting, continues today. 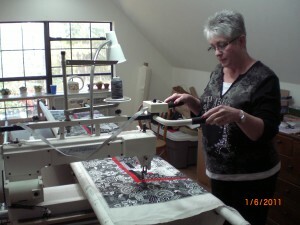 I first met Judy Reynolds in 2005, working at a quilt shop with her. I had an idea for a baby quilt and told Judy I wanted to give it to her. She said to make a sample and write instructions and she and her partner, Amy Cotham, would decide if they could market my pattern under the Black Cat Creations name. I’m happy to say that “Snuggle Up” was published and I have been designing ever since. Judy and Amy are great and very supportive of their guest designers. As mentioned earlier, I love applique, all kinds. Needle turn, fused or dimensional. I have several wool applique quilt patterns that I really enjoyed designing. Pictured here are A Yard of Roses, A Yard of Hydrangeas, and A Yard of Sunflowers. But, most of my patterns are pieced, and some have a little applique on them. My favorite is “A Bouquet for My Love”. I designed this for my husband in blues and browns. For the last 44 years he’s brought me flowers for no reason, I thought it was time I gave him some in return. I don’t have a typical work day schedule. I might sew all day for several days in a row and then not sew at all for a week. My husband is semi-retired, if that explains anything! If I have an idea in my head, I might spend all day and half the night to get it down on paper before I forget what the idea was. I have a room above the garage for my Tin Lizzie and my reference books and extra fabric, of course. As for inspiration, I get it from lots of places. Sometimes the fabric just speaks to me and I know right away what it will be when finished. 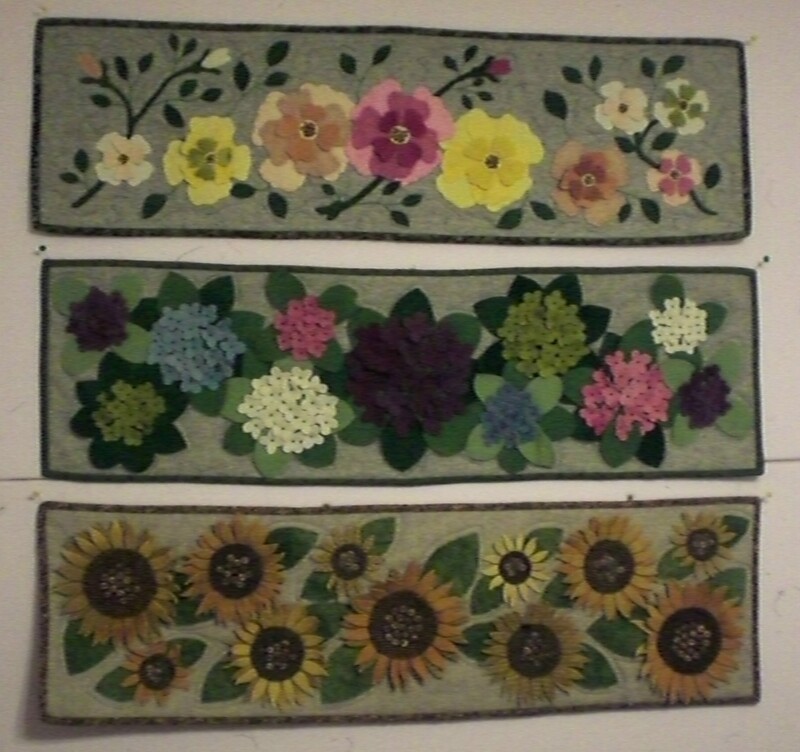 I got several of my wool designs by working in my flower beds. Sometimes just doodling on a piece of paper will give me an idea. “Chocolate Fondue” was inspired by the fabric. When I saw that beautiful pink and brown fabric, I could almost taste chocolate dipped strawberries and chocolate covered cherries. And I always keep a notebook handy to jot down ideas. You never know when these ideas will turn into a quilt pattern! A Bouquet For My Love by Claudia Atchison. This beautiful fat quarter friendly quilt has easy patchwork and easy three dimensional machine applique. A soft, pretty, romantic quilt just right for a queen sized bed. For a chance to win this pattern leave a comment on this post. For more chances to win, leave a post on future blog posts until midnight (central time) Feb 4th. For even more chances to win, like us at our QuiltersWarehouse Facebook page and leave a comment on our Facebook status updates and links and pictures posted that are dated between now and Feb 4th. An interview with Claudia coming soon!